I want to do my exercise at home. What do I need? I suppose one could argue that the type of equipment will vary based on goals. The proverbial “they” say that if weight loss is the primary goal, you need a treadmill, elliptical, bike, stepper, or whatever else is out there. Then add some weights. 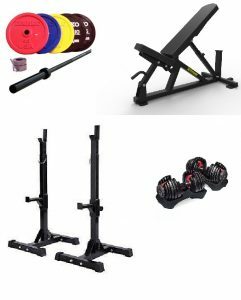 Other people may be more interested in building huge amounts of strength, get better at a sport or lose a little body fat and just be healthier,” each of which would dictate purchasing different equipment. 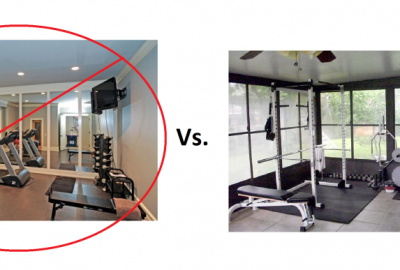 Humor my suggestion that the home gym set up DOES NOT change based on goals. All goals involve the building of muscle* or the preservation of muscle while burning fat. More simply, everyone should be trying to build muscle and lose body fat. The only difference is the degree to which they will go. Technically you don’t “need” anything. You could make very positive changes in your fitness level and health by doing things that don’t require any equipment. But let’s assume that you are looking for the most effective home exercise area given your space and budget. But first, if you want to lose weight, all the exercise in the world won’t matter if your nutrition is off. So let’s say that you are following a reasonable, moderate nutrition plan that is allowing for 1-2 pounds of fat loss per week within a relatively small calorie deficit. If you want to achieve the best possible results (and assuming your doctor clears you and you learn proper form and practice the moves), you should base your entire exercise program around squats, chest press, deadlift, shoulder press and row. You should be shooting to get as strong as possible* while controlling your nutrition. (It makes little sense to get strong but gain 30 pounds of fat at the same time.) For most people, the mindset and exercise program designed to bring up your absolute strength will make the journey interesting and show you continuous, objective progress. The enthusiasm you generate by seeing quantifiable results will make you more likely to hit your nutrition numbers, make healthier choices, not eat the second piece of cake, go to sleep a little earlier, etc. On top of that, over the long run, attention to nutrition along with progressive resistance training (with a wide variety of set, rep, rest period, tempos, etc.) will lead to the most favorable body composition and health changes. So if you have 9 feet across of 8 feet deep, buy barbell stands, an Olympic barbell, plates and an adjustable bench. If you have room in the space and budget for dumbbells, buy them. If you have room for a piece of cardio equipment, go for it. 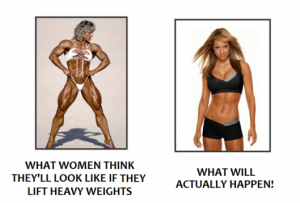 But you can get very good cardio using barbells and dumbbells, whereas you can’t do deadlifts with an elliptical. And you don’t have to worry about doing a 5-minute plank. *If that thought makes you concerned about getting too muscular, please leave a comment below and we will alleviate your concern.